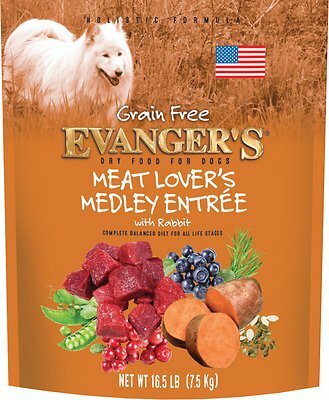 Evanger's Meat Lover's Medley with Rabbit Grain-Free Dry Dog Food combines three unique meats—rabbit, beef and pork—for a delicious medley of meat that your dog will love. The recipe uses nutrient-rich fruits and vegetables instead of grains for optimal canine health. It contains probiotics to support immune and digestive health, as well as omega 3 and 6 for joint, skin and coat health. Plus, it's suitable for all breeds and life stages. Perfect for all breeds and life stages and made in the USA! Pork Meal, Sweet Potatoes, Buffalo Meal, Lentils, Peas, Tapioca Starch, Sunflower Oil (preserved with Mixed Tocopherols), Rabbit Meal, Flaxseed, Natural Flavors, Coconut Oil (preserved with Mixed Tocopherols), Pumpkin Meal, Dried Kelp, DL-Methionine, Choline Chloride, Monosodium Phosphate, Potassium Chloride, Fructooligosaccharide (Probiotics), Dried Cranberries, Dried Blueberries, Yucca Schidigera Extract, Vitamins (Vitamin E Supplement, Ascorbic Acid, Niacin Supplement, Organic Dried Kelp, D-Calcium Pantothenate, Riboflavin Supplement, Biotin, Vitamin B12 Supplement, Thiamine Mononitrate, Vitamin A Acetate, Pyridoxine hydrochloride, Citric Acid, Vitamin D3 Supplement, Folic Acid), Minerals (Ferrous Sulfate, Zinc Sulfate, Zinc Proteinate, Iron Proteinate, Copper Sulfate, Zinc Oxide, Manganese Sulfate, Manganese Proteinate, Copper Proteinate, Manganous Oxide, Sodium Selenite, Calcium Iodate). Puppies, pregnant and nursing dogs may require 2 - 3 times above amounts, and reduced for less active or older dogs. Amount of food your dog requires depends on activity, age, environment and breed. My dogs both are not big fans of this flavor. I have a Chihuahua and a 10-month old border collie pup. Nothing wrong with the freshness or packaging, just the flavor. I have a hard to please little dog, and he has been eating the Evanger's Grain Free Meat Lover's Medley steadily since I got it. I cannot begin to express what a big deal this is! He can be super picky. Moby LOVES it! He gobbles it up... he has been "so so" on other kibble and then I bought this and he is wild about it! I have a 15 month old lab puppy who eats everything that in sight but absolutely WILL NOT eat Evangers!!! This is very unusual for him. I have tried enhancing the taste but he still won't eat it. I'm going to have find another yummy tasting one now. Ever since Fromm got discontinued from your stock I have been having trouble finding one that he likes, is nutritious and that I can afford. I have already spent quite a bit in my search for the best match for me and my fur Baby. I LOVE Chewy and their customer service so I hope to find what I am looking for through your website. 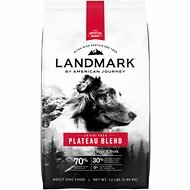 My older lab is 11 and this dry food has been recommended by her vet. She also loves it and eats it daily mixed with a little wet food. My younger lab eats it and loves it as well. They are both happy and healthy! The BEST dog food ever and the healthiest I must add! Your dogs deserve the BEST!! !